1. Dry-fry the pancetta in a large saucepan over a medium heat for 1-2 minutes or until lightly golden brown. 2. Add the soffritto mix and a splash of water and fry for another 3 minutes. 3. Stir in the beans, tomatoes and hot stock and bring to the boil. Cover with a lid and simmer for 5 minutes, then stir in the kale and simmer, uncovered, for 2 minutes or until just tender. 4. Spoon into 4 serving bowls and scatter with chopped basil or parsley and grated parmigiano reggiano to serve. 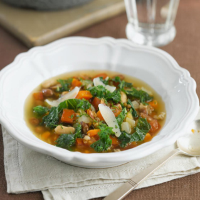 This soup is ideal for freezing. Wait until it cools, then pour into a rigid container and freeze for up to three months. Thaw overnight in the fridge and then reheat until piping hot before serving. For an alternative to kale, try shredded savoy cabbage or spring greens.